I’m not sure of the exact catalyst but I’m inspired. After a long spell of feeling a little blah in the kitchen I’m ready do a little more cooking and some better eating. I also have a lot of new projects and recipe ideas in the works. Normally I love to brag about the weather here in Arizona but after seeing pictures on Facebook from friends across the country who are covered in snow I can only sigh for you. I got my first sun burn of the year this weekend but if it is any consolation my electricity bill will be quadrupled in a few months when the temperature is over 100° for months. If you want to come visit me now is the time, hurry space is limited. Breakfast will be a little different this week. We are still eating the leftovers from Healthy Cravings. I’ll post a recap soon but we are still working on Breakfast Burritos, oatmeal, and Breakfast Quinoa. Lunch will hopefully be leftovers if I plan well. I also like soup and sandwich (or even salad) combo’s for lunch. These may be a good option for anyone taking a lunch to work. Burritos are easy to transport as well and we just happen to have Mexican Bean and Rice Casserole that is fantastic wrapped in a tortilla or put on top of a baked potato. My boys prefer sandwiches and get incredibly happy anytime bread is involved. They seem to be a little pickier lately but I’m hoping it passes soon. Snacks are usually fruit or even fruit parfaits but I’m working on a few new recipes that will probably make an appearance here, oatmeal raisin cookies are in the lineup. I’m sure the majority of our snacks will be apples and oranges. Dinner is where my excitement lies. I bought a pack of avocados and I am dreaming of all the ways to use them. I’m also planning to start using the grill again, oh yes, it is time. 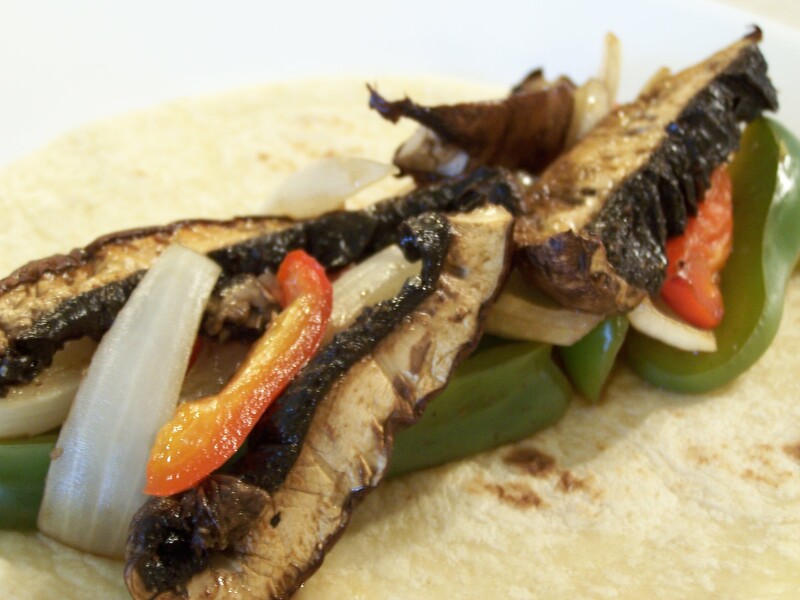 Portobello Fajitas paired with Mexican Rice and Unfried Beans are a great combination and worthy of company although we don’t have any coming. A few of the new things I’m working on include Grilled Avocado and Veggie Wraps with black beans and cilantro-lime rice. I also have a new sauce recipe that received a great review from my husband last night. I’m still tweaking it but we will have it again on Baked Potatoes and Steamed Broccoli or maybe over a rice dish. For more dinner ideas check out the Recipe Page. Are you experiencing grilling weather or soup weather? No matter where you are I hope you are feeling inspired to cook and eat well! I am jealous of your warm grilling weather! It is definitely not grilling weather here…I don’t know if spring will ever arrive. Winter seems to be dragging on and on!